Copyright: © Copyright 1991 BMG Songs, Inc./Kid Brothers of St. Frank Music Publishing (ASCAP) (admin. by Brentwood-Benson Music Publishings, Inc.) All rights reserved. Used by permission; © Copyright 2002 Word Music, LLC (ASCAP)/Smittyfly Music (ASCAP). All rights admin. by Word Music. LLC. All rights reserved. Used by permission. 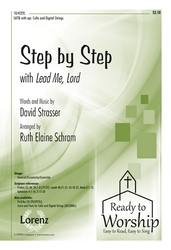 STEP BY STEP with GUIDE ME, O THOU GREAT JEHOVAH Step by Step with "Lead Me, Lord" Step by Step with "Lead Me, Lord"